The 2016 EVO Summer Cinema Series in Stanley Park is in full swing! It’s going to be another epic summer of classic movies! Every Tuesday night, from July 5 to August 23, Fresh Air Cinema will be showing free outdoor movies at Second Beach in Stanley Park. 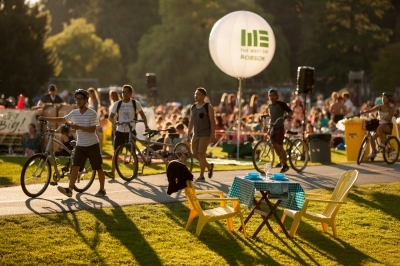 This is one of the most widely anticipated West End summer events and the West End BIA is proud to be a founding partner. Free seating is available on the Grand Lawn at Ceperley Meadow, with no reservations required. Simply grab a blanket or lawn chair and bring your friends for an evening of summer fun. 3rd Annual Dinner and a Movie! If you’re looking to make your experience even more memorable, we are proud to present the 3rd Annual Dinner and a Movie promotion. We have partnered with eight (8) amazing West End eateries to bring you the ultimate VIP movie-going experience. Select the movie of your choice and the event organizers will make a reservation at the partner restaurant in your name for a 6:30PM meal. This year, as an added incentive, we have sponsored free reserved VIP seats in the Yellow Pages VIP seating zone at the Summer Cinema Series event. Each restaurant has 10 VIP seats available and they are packaging these seats with a pre-show dinner to bring you the ultimate VIP experience. After dinner, simply head to the park before showtime (dusk, all summer-long). Who knows – there may even be some bonus freebies waiting for you! This is one of the best deals around and the perfect opportunity to support your favourite West End restaurants this summer.